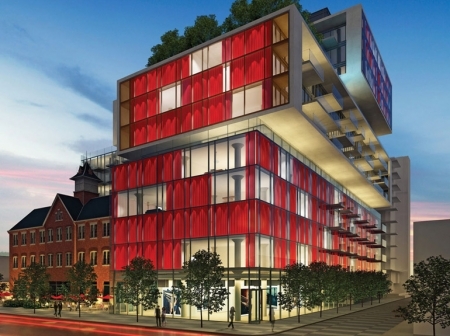 Fashion House has an iconic 150-foot frontage on King Street (560 King St W). Freed Developments has opted to celebrate King Street’s heritage as a fashion district. Fashion House is a modern 12-storey structure, designed by Toronto’s Core Architects, is a series of stacked glass and steel boxes which wrap around the historic three-storey Toronto Silverplate building, restored to its 1882 beauty. Initially Fashion House was meant to have 14 floors (the City said no to 14 floors), and uniform lipstick-red curtains lining the floor-to-ceiling windows. Suites will use modern built-ins to act as room dividers. Fashion House will house retail and restaurants on its ground level. There are still suites remaining, ranging in size from 464 sq ft to 1566 sq ft. Prices range from $304,900 to $1,019,000. >>Click here to contact me for more information, or if you are interested in any other Toronto condo or loft development (new or resale).